The Yellow Group had a fun visit to Europe this week! We learned about fairy tales that come from Scandinavia and Germany. We examined European architecture including Neuschwanstein Castle, the Eiffel Tower, and London’s Tower Bridge. Using giant blocks we recreated these and brought Europe to our own backyard! We even learned some words and songs in Italian, German, and French! The sights, sounds, and architecture of Europe were on the minds of our preschool kids this week as we began looking at all the different countries that make up this rich continent. We explored all the different types of homes, buildings, and monuments found in Europe then worked in groups to replicate those structures using blocks, legos, and snap cubes. Also, we then used playdough to imitate some favorite European dishes, such as pizza, pretzels, and pastries. As the week continued, we enjoyed the classic storybook Strega Nona and noticed how sentences always show a complete thought. We then tried writing a complete thought, beginning with a capital letter and ending with a period. We also created mini-murals showcasing a map of Italy, the Mona Lisa, and the Leaning Tower of Pisa. Our European Adventure has been a memorable one … I hope we get to visit there again soon! On another note, it was nice to see so many parents last week at our Meet and Greet. Thank you for coming! Next week, we are off to Africa. Europe is well known for its historical architect. 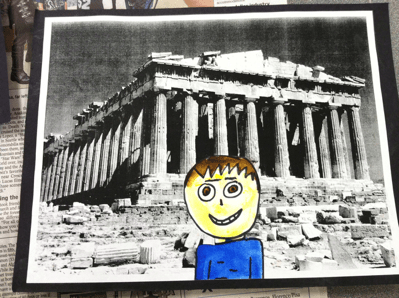 This week Group Three had fun exploring these sculptures through text, media, and art. Campers learner about Big Ben and created their own Eiffel Tower. At the Metropolitan Museum of Art, they were able the explore creations from around the world. Children were able to compare and contrast different forms of architectural design. Week 4 in Europe was a blast, can’t to travel again next week! Europe has many famous structures and artwork to observe and research. 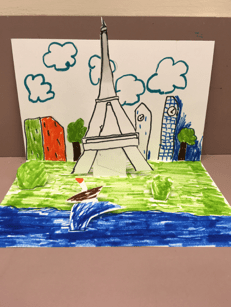 Together we learned about the art and architecture of Europe by reading: Art is… by Bob Raczka, Young Frank Architect by Frank Viva, 13 Buildings Children Should Know by Annette Roader, Adventure Homes by Gerry Bailey, and Buildings by Karen Hosack. We watched the movie From the Mixed-Up Files of Mrs. Basil E. Frankweiler so when we visited The Metropolitan Museum of Art we could track Claudia and Jamie’s journey through the museum. Group 5 architects explored their creativity by designing their own structures and artwork. We continue to learn about the importance of standing by your friends and always being kind as we are reading Wonder. This week in music, Discoveries campers listened to some music from different countries in Europe, sang songs and tried new instruments. Adventures campers listened to music from different areas of Europe and talked about the differences and similarities, and then learned a folk song from Ireland called The Rattlin’ Bog. This week during Bodies in Motion class campers participated in a number of full inclusion activities such as tag games and cooperative game play. Discoveries Students enjoyed the story “Caps for Sale” and we all had such a fun time putting on the hats and trying to break the Peddler’s record of 17. In cooking we travelled to Europe and landed in Paris where we enjoyed making chocolate and cheese Croissants. Then we hopped over to Spain to enjoy making a Margo smoothie that would later become a Paleta. This week we continued to travel around the world and made a stop on the continent of Europe/Europa. We went to a small village in Russia and met a man selling hats/sombreros. The peddler went up and down the road selling his hats; but no one bought the hats. The peddler soon met some monkeys who gave him the monkey business. They stole his hats when he fell asleep. The students counted the hats in Spanish and each acted out the parts of the Peddler and the monkeys. In cooking Paris was a destination enjoyed by all. We made chocolate and cheese Croissants.We also travelled to Spain for tapas and enjoyed a Spanish tortilla made with potato chips. To their surprise a tortilla is not just for tacos. Paletas have been a hit for the kids so we made a “Sunshine Punch Smoothie” that would later become Paletas. STEMtastic! The Hajjar STEM Center was abuzz this week thanks to stellar STEM classes for both campers and teachers. Immersive campers in STEM Challenge built and then ‘battled’ with their ‘bot creations and worked together hands-on with STEM Institute educators in a collaborative makerspace. These motivated teachers also learned all about programming, 3D printing, and more, earning professional development credits along the way. 3D Origami, Archery, Ballet, Fencing, and Woodworking were just a few of the exciting courses that D-E 360° Summer Connections Enrichment campers enjoyed this week. There are still some openings in many of these unique ‘a la carte’ courses for the next few weeks – click here for details and to register today! Meanwhile, our Scholars hit the half-way point in their credit-earning classes! Hungry? Click here for our Enrichment/Scholars/Immersives Week 4 (July 16 – 20) Menu! For Week 4 (July 16-July 20) Enrichment, Scholars and Immersive Programs – Building Assignments and Classroom Numbers can be found by clicking here. Yum! Click here for our Discoveries & Adventures Week 4 (July 16 – 20) Menu.